It's actually Triangle Below Canal. krulltime, can I see your Real New Yorker pass? So what am I? A tourist? Sir, would you mind stepping over here for a moment? HARLEM — Artimus Construction was chosen by the Economic Development Corporation to build a 50-unit apartment building with space for a local dance group on 110th Street and Frederick Douglass Boulevard. The 13,500 square foot lot on the northwest corner of Central Park North at 2040 Frederick Douglass Boulevard, which contained a gas station and was described by the city as thelast underutilized piece of property on Central Park, was bought by Artimus for $25 million. The company, which has built several projects in Harlem, plans an 80 percent market-rate, 20 percent affordable development. The building could be 12 stories tall without requiring any zoning changes. The ground floor will also contain a retail space. Millennium Dance Company, currently located in a 3,000 square foot space on Frederick Douglass Boulevard between 135th and 136th streets will occupy 8,000 square feet of space on the first floor. The dance company provides classes for children and adults with a pre-professional track for youth. "This planned mixed use space has a really nice balance of market rate and affordable housing, cultural space and community space," said a NYCEDC spokeswoman. The former BP gas station, one of the few in the area, closed down recently. It was believed to be the only gas station along Central Park. The former owner of the space Carmie Elmore Jr., vice president of 110th Street Service Station, Inc., owned the space but the city maintained the right to reacquire the property as part of the 1996 deed of sale. Elmore had filed suit against the city but came to a settlement, said city officials who declined to disclose the amount. Calls to Artimus were not immediately returned. Workers were seen dismantling the gas station Wednesday. NYCEDC issued a request for expressions of interest for the chance to redevelop the 13,500 square foot space on the northwest corner of Central Park North at Frederick Douglass Boulevard and 110th Street in June of 2012 and received "robust" interest in the project from developers. They then issued a request for proposals. Area groups such as the Friends of Frederick Douglass Circle say they want whatever is built there to fit in with the recently renovated circle. The circle is at the entrance to a revived Frederick Douglass Boulevard which has seen an explosion in the last several years of restaurants, bars, lounges, co-ops, condos and newly renovated apartment buildings. 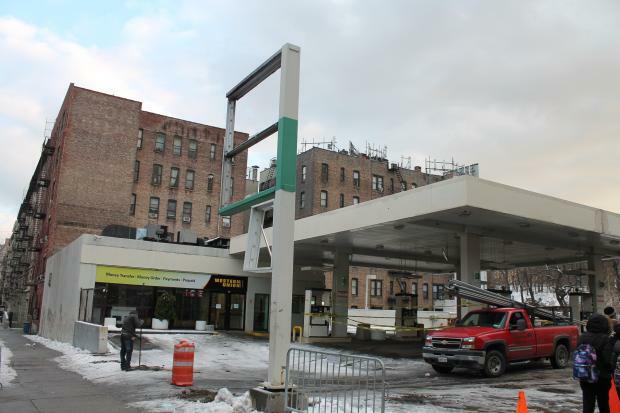 Workers were dismantling the gas station at 110th Street and Frederick Douglass Boulevard on Wednesday where a residential tower will rise. That's an example of how crazy conservative the zoning FAR allowances are for many parts of the city. Why is there only 50 units on a fairly large lot and a subway stop steps away? Would the city really be that worse off if there were, say, 100 units instead? Or 400, or 800? It's hard to argue with this, but it's also one of those affordability issues. Imagine an average unit size of the minimum legally allowed apartment (400 sqft) Now, the towers across the street are 20 stories. This lot is approximately 116x112. That's 13,000 sqft or 32 apts/floor. At that setup, we're at 640 apartments. It's that kind of density and construction we're going to need to fit all the people in who want to be here without rent spiraling. Even if we build all 1200sqft 3 BRs instead of studios and expect epople to be roomates, it's still 210 apartments, not 50. Just crazy. Exactly Roldan. This city really shoots itself in the foot when it comes to not allowing adequate growth. Your illustration really shows how the zoning FAR's are too ridiculously low. 50 measly units on that large lot. Unfreakinbelievable. The crazy thing is that to meet the unmet demand for more apartments, another whole bunch of sites will have to be redeveloped, meaning more people and businesses will have to be uprooted and displaced. Does not makes sense for us but for someone it makes perfect sense. In Lefferts Garden Brooklyn 33 Lincoln Rd right next to the train station will be 9 floors (the original 20 floor plan was stalled) while 626 Flatbush roughly 5 blocks from the train in either direction will be 23 floors. It's not just about height, though. It really is about density. Much of this actually comes down to site coverage and apartment size more than it does about height. 432park only has, what, 125 apartments in it? It's pretty tall, yeah? At the same time, NYbG has 900+ apartments in it and is 2/3rds the height. As for the financial incentives of any given developer, someone owns a site and has a budget, so there are, certainly, market constraints on construction for any given site. But NYC needs to get out of its own way some with restrictive zoning. Many cities would be flattered by having such demand. Somewhere like Rochester NY has incredibly unrestrictive zoning downtown, but there is little financial interest (market demand, but only by proxy) in developing there. To have such problems there as having nearly unmeetable demand for apartments.